Liverpool second-choice goalkeeper Simon Mignolet has won the internet after he hilariously trolled his Belgium international teammate, Thibaut Courtois. 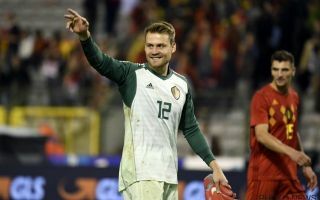 Simon Mignolet took to Instagram yesterday to brutally troll his teammate Thibaut Courtois, the current Real Madrid and former Chelsea stopper made a shocking mistake in Belgium’s clash against Russia on Thursday evening. Everything has gone downhill for Courtois since he decided to ditch Chelsea last summer for Real Madrid, the lanky stopper has hardly put a foot right since moving to Spain and his poor form looks as though it’s beginning to impact Belgium as well.